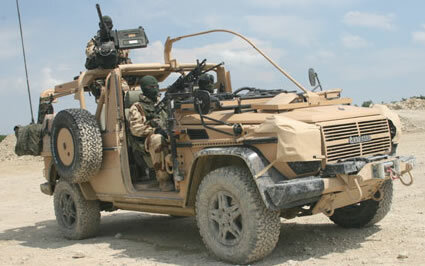 The contract for The French Panhard VPS 4×4 Patrol Vehicle for the British Army 22nd Squadron SAS Patrol vehicle was awarded to Panhard by the DGA in 2005 for the Special Operations Command. Based on a Mercedes G chassis, the vehicle has great range and a twin electric circuit which enables it to be used in difficult climatic conditions. In addition, it can be rapidly deployed to theatre as it is equipped with tie-down rings. The crew is protected against anti-personnel mines thanks to an armoured floor fitted under the hull. 51 VPS have been ordered by the Ministry of Defence.